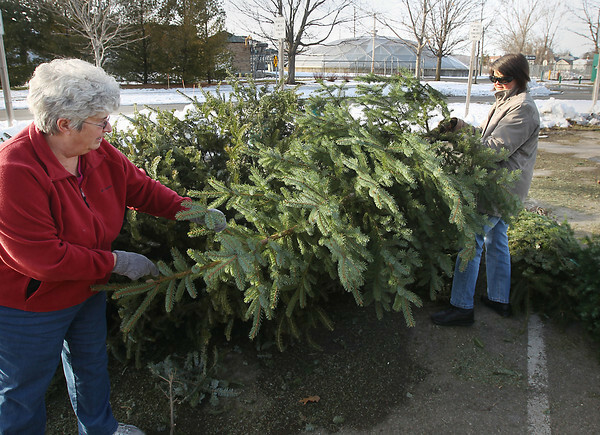 Joan Kroupa, left, of Old Mission Peninsula, and her daughter, Michelle Kroupa, of Traverse City, set Michelle's Christmas tree Thursday, January 10, 2013 onto the Christmas Tree drop site at Hull Park in Traverse City. Trees, wreaths and garland can be dropped off at the site, at no charge, until Sunday, January 20. The trees, wreaths and garland will be chipped and used for trail maintenance and erosion control.